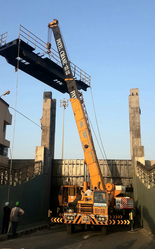 S.S. Patel Tempo and crane services has a diverse product range suiting customer’s requirements in mind. Our primary market for dealing with good service. while serving our customers we take their cultural inclination, likings and interest in mind. This understanding and experience is fused with latest services in trend and excellent. This is the secret of our customer’s delight. Soma Roadis Surat Hajira NH6 Pvt. Ltd.
full-service crane company. Crane rental is only the beginning of what we can offer you. There is not a job around that is too small or too large, too short or too long. We will attempt to accommodate your every need no matter the magnitude of the project. The services offered by SDCS will enable you to complete your project safely, efficiently and economically. We are offering Towing and Lifting Service to different commercial places for lifting services. Highly reliable machines are used for lifting which do not let lifted products to be damaged. Consumers can avail these services in different places at affordable prices. We are providing Material Lifting Crane Rental service. These cranes are designed and developed using superior grade raw materials and cutting-edge technology in compliance with international quality standards. These are widely used in workshops, industries and factories for lifting material.